Ecologistas en Acción declares 2009 as the year of “living better with less” (less to live better, using less to live better, consuming less to live better, etc. ), the year of the equitable decrease. With this slogan in mind, this organization will carry out a series of campaigns, in the 13 areas in which it works, that will help us advance towards a more sustainable and compassionate society. Ecologistas en Acción will work to make 2009 “the year of the equitable decrease”. It is obvious that we have now surpassed the limits of the planet: we consume resources at a speed that is greater than their capacity for recovery, and we produce waste at a rhythm that is impossible for the ecosystems to assimilate. It is also evident that we live in a society with growing inequality. For the ecologist organization, it is now time to say “enough”, to understand that “we need less to live better”. That is, we have to evolve toward an economy that does not need to grow constantly. Thus, in the overdeveloped countries on the planet, like ours, instead of constantly increasing the use of energy and resources, we would have to reduce their use. Only then could we adjust to the limits of the planet and advance towards more just societies that would allow millions of people to escape from misery. The crisis we are experiencing, in addition to being dramatic for the lives of many people, also provides an opportunity, the opportunity to advance toward sustainability. Under the umbrella of the common slogan “living better with less”, Ecologistas en Acción will be leading a series of campaigns in 2009. 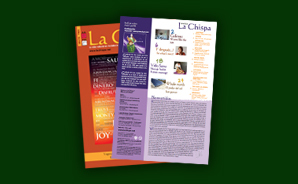 A sample of some of them can be found here (Chispa url). Less CO2 to live better. The Confederation will continue to encourage energy efficiency and saving together with renewable energies and fight against climate change, new projected power plants and refineries. The campaign will have its high point in the celebration of the Copenhagen Climate Conference, to which Ecologistas en Acción will send buses. Fewer highways to live better. In its wager for a local economy and against the implementation of the PEIT (Strategic Transport Infrastructure Plan), which signifies the construction of 6,000 new kilometres of highways and 9,000 km of high-speed trains, Ecologistas en Acción will continue to oppose on-site each of the projects begun. Less growth to live better. There will be a protest and awareness campaign about the loss of biodiversity caused by economic growth, especially due to the over-exploitation of natural resources, the effects that the loss of biodiversity is having on the ecosystem services, and the non-fulfilment of the objective of detaining the loss of biodiversity in 2010. Fewer water re-direction projects to live better. One line of work will be the opposition to the water diversion plans of this Government. Less globalization to live better. There will be an energizing of the protest marches against the anti-crisis measures that involve an increase in consumption and globalization. Less consumption to live better. The association works toward consumption according to the real needs of people and against advertising. For this purpose, there will be a celebration of the Day without Shopping, and the Shadow Awards will be awarded for the most misleading advertising. Less urban development to live better. Along these lines, the organization will maintain active its “Not one more metre of cement” campaign, which is represented in hundreds of specific battles against urban projects. Fewer cars to live better. The campaigns will continue against the abusive use of the car, like the day without cars, the campaign against four wheel drives, or the denouncement of the low air quality in the cities, elaborating a report on the main pollutants in our State. Less industrial agriculture to live better. Within this framework, the “For an active (a vibrant, a lively) rural world” and “Transgenic Free Zones” campaigns will play a fundamental role. Less industrial fishing to live better. Ecologistas en Acción will work toward the defence of sustainable and ecological fishing practices and against industrial over-fishing. In this sense, the campaign in defence of the red tuna, the joint work with the guilds and the campaign against the degradation of the coast (the “Black Flags” campaign) will continue to be essential for the organization.